in the upper right, are displayed the elements and the race of your Dinoz. in the red circle, is displayed the level of your Dinoz: this indicates the strength of a Dinoz. in the bar marked hp, are health points: this is the life of your Dinoz. When the bar is totally empty, your Dinoz will die. in the bar marked xp, are experience points: these are earned after each battle. When the bar is full, your Dinoz will be able to level up. 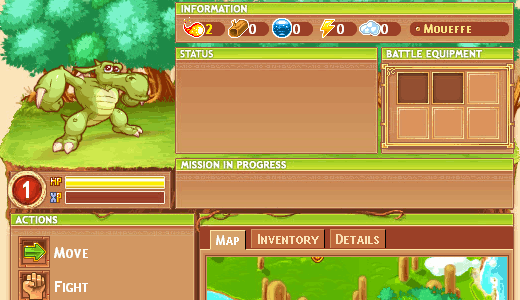 below, are listed the different actions which your Dinoz can perform, such as Move and Fight. Next we will explain the various actions that your Dinoz can perform.